A 73-year-old Bradenton man died in a collision recently. The man was standing on a center grass median facing in a northbound direction on State Road 64 on a Tuesday morning at approximately 8:21 a.m. As he attempted to cross the road, he was struck by an 18-year-old driver in a Nissan Altima, according to Patch. According to a highway patrol report, the pedestrian and driver did not see each other. The Nissan Altima had its parking lights on, but did not have its headlights on at the time of the incident. The driver was charged with careless driving for her role in the fatal pedestrian accident. When a motorist engages in careless driving, by definition this means the motorist is lacking in the reasonable care necessary for safe operation of a vehicle. When a motorist drives without exercising appropriate care, he endangers himself, and he puts people in other cars at risk. This danger, however, is nothing compared to the high chances a pedestrian will be hurt or killed. While drivers inside of vehicles are protected by air bags and other safety features, pedestrians have no protection and are not shielded at all from the force of the impact. When struck by a car, a pedestrian's body is forced to absorb the entire impact of the collision. A person on foot can be seriously hurt or even killed even if the accident doesn't happen at very high speeds. Of course, a higher speed crash, when a car has more momentum, has an even greater likelihood of being deadly for a pedestrian. 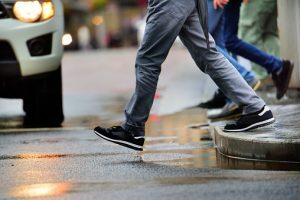 If a pedestrian is killed by a careless driver, or is injured by a motorist driving recklessly, the victim can pursue a case for compensation or surviving family members can pursue a wrongful death claim. If the motorist who caused the accident is found guilty of careless driving, as the teen driver who allegedly caused this recent crash could be, this can create a presumption the driver was more negligent than he should have been. This negligence is one of the essential elements of a personal injury or wrongful death claim, along with showing the negligence was the direct cause of harm and demonstrating the extent of the damages. Pedestrians and their families should be certain to keep track of all costs, including medical expenditures and funeral costs, associated with the accident. If it can be proved a driver was careless and struck the pedestrian (or was at least partially responsible for hitting the pedestrian due to carelessness) this can entitle the victim to damages in a negotiated settlement or in a personal injury court case.